It’s been a great weekend. A little housekeeping, a little yard work, and a little relaxation! A perfect combination. 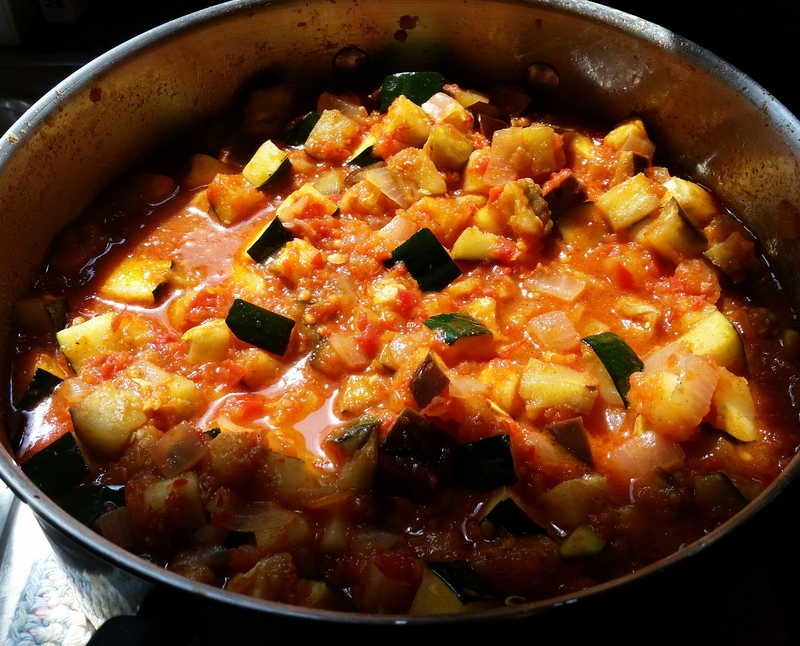 Talk about a perfect combination, this ratatouille – the perfect combination of spices with the perfect combination of vegetables, bring this french stew a flair of the Indian combining to make a huge bowl of YUM!!! Preheat oven to 450°. Toss zucchini with salt, pepper, and a tablespoon of olive oil. Spread out in one layer on a baking sheet (you’ll have to do this in batches). Bake each for about 10 minutes, until cooked through and getting golden brown on the bottom. Put the finished batches aside in a bowl as you go. Toss the eggplant with a tsp of cumin, 1/2 tsp of cardamom, a smidge more salt and pepper. Repeat the same process as you did with the zucchini. Add the roasted eggplant to the bowl of zucchini. 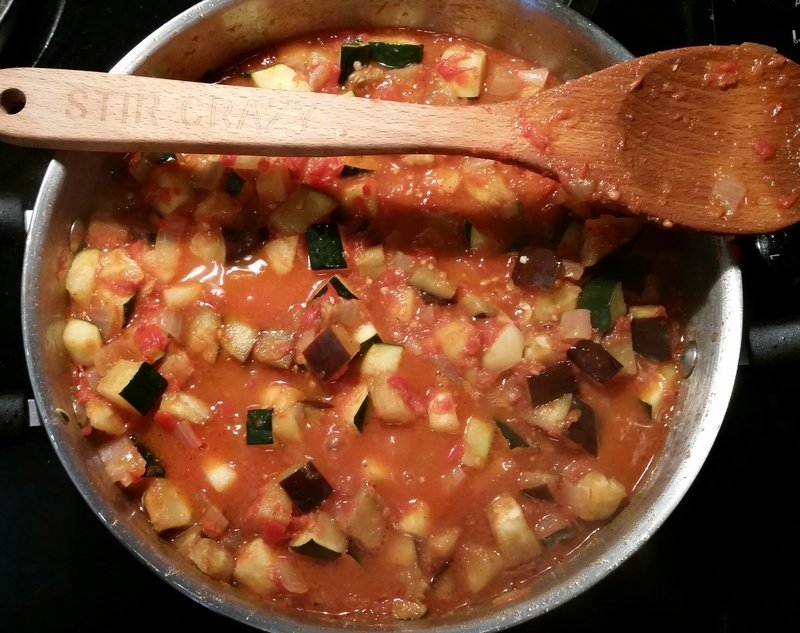 As you roast the zucchini and eggplant, heat 1/2 cup of olive oil over medium-high heat in a large stock pot. Add onion and shallot and cook until softened and translucent, stirring occasionally. Add garlic and cook 5 more minutes. Season with salt and pepper. Puree the red peppers and add to the pot. Season again with a little salt and pepper. Continue cooking, stirring frequently, until it becomes thick like jam. About 10 to 15 minutes. Puree the tomatoes and add them to the pot. Bring to a boil, and then reduce to a simmer. Cook for another 15 to 20 minutes, stirring frequently. The mixture will start to resemble a sauce consistency. Add a tsp of cumin and a tsp of cardamom. To finish, once the mixture has attained sauce status, sir in the garam masala and coriander. Carefully add the zucchini and eggplant. Cook for 10 more minutes. Roll that beautiful patty melt footage! 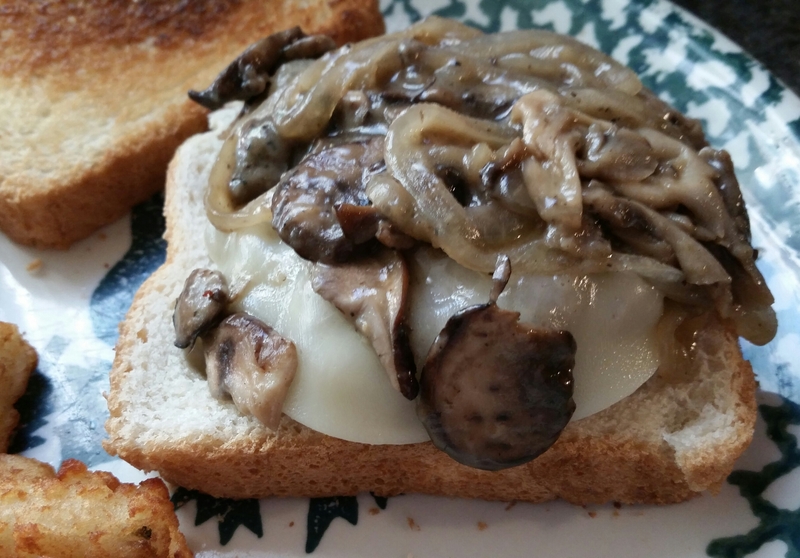 Oniony, mushroomy, ooey, gooey goodness. Just looking at that photo is making my mouth water. I was looking for something quick and easy, again. And this sammy was just the ticket. It took less time to make this sandwich than it did to make the french fries….Seriously! I was actually waiting for the fries to get done. Chop half of the sliced onions and combine it with the hamburger, 1/8 tsp salt, 1/8 tsp pepper in a medium bowl. Divide into 4 patties. Heat large non-stick pan over medium-high heat. Add 1 tsp oil to pan. Add patties, cook for 4 minutes on each side. In a medium pan, saute remaining onions, mushrooms, 1/8 tsp salt and 1/8 tsp pepper for 3 minutes. Sprinkle flour over mushroom mixture, cook for 1 minute. Stir in beef broth, cook for 30 seconds or until thick. Remove from heat and keep warm. 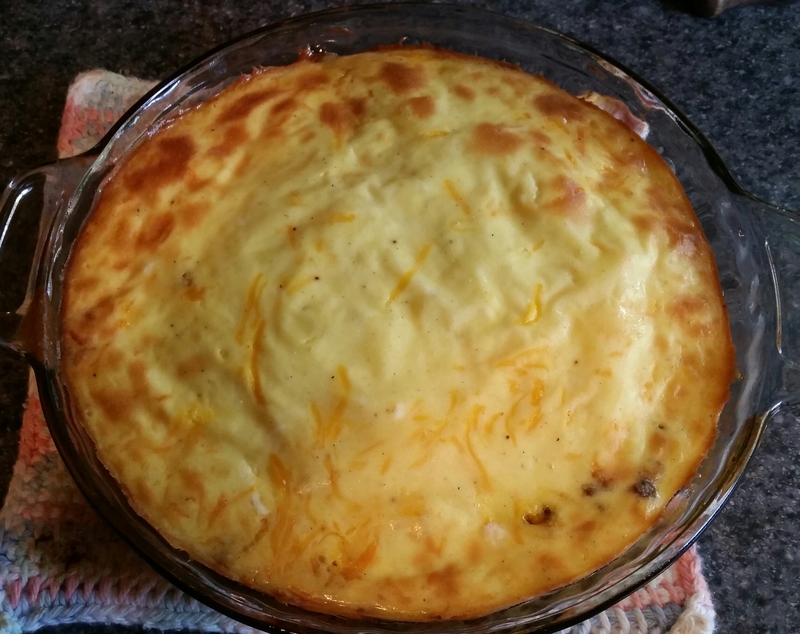 Remove patties from large pan, and keep warm. Wipe pan clean. Heat pan to medium-high heat. Coat 1side of each slice of bread with butter (or cooking spray). 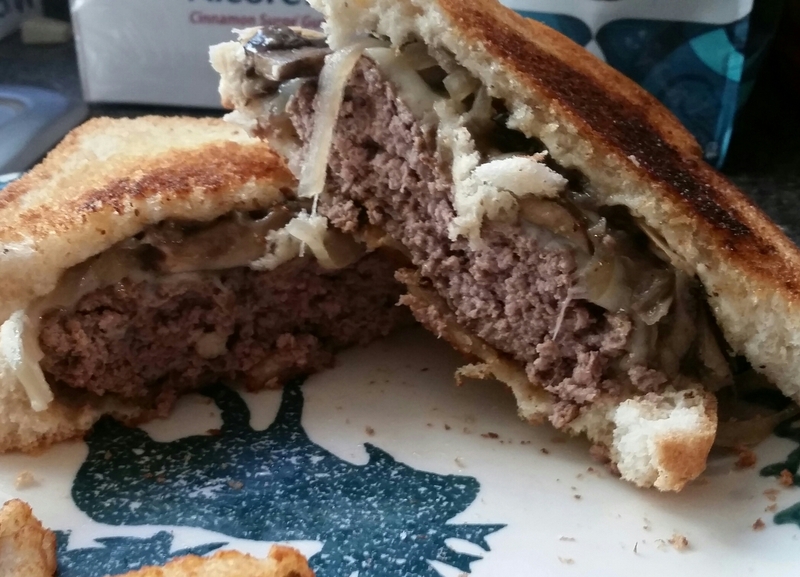 Top each with 1 patty, 1 cheese slice, and 1/4 of mushroom mixture. Top with second slice of coated bread. Cook on each side for 2 minutes or until brown. Talk about ridiculously quick and easy to make, this casserole was put together in under 15 minutes (including chopping time). I walked in the door at 4:36, and we were eating by 5:30, truth! Not only is this casserole fast and easy, it is incredibly delicious. The proof… my husband ate two helpings, TWO helpings! Of course, I had to follow suit, oh come on twist my arm! 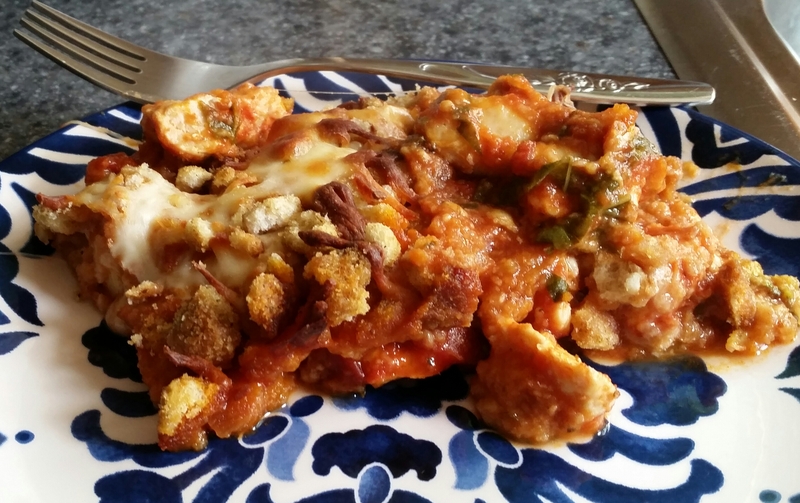 Not only is the chicken parm casserole so cheesy, so sauce, it is somewhat “healthy-ified” (say what?!!) This casserole replaces all the bread of traditional chicken parmesan, with Italian croutons, more sauce, and two types of cheese. All the flavor less fat and calories! SCORE! Double SCORE! Preheat oven to 350°. Lightly mist 9 x 13 baking dish with non-stick spray. Spread cubed pieces of chicken across the bottom of the baking dish. Sprinkle minced garlic and basil evenly over chicken. Spread the marinara sauce across chicken. On top of sauce, sprinkle 3/4 cup of the mozzarella cheese and 1 oz of the parmesan cheese. Sprinkle the crushed croutons on top and follow with the remaining cheeses. Bake for 40 to 45 minutes. Let stand for 5 minutes before serving. Holy bananas, batman! This trifle is perfect for a dazzling dessert, that’s sure to please even the pickiest of palates. The strawberries and blueberries are refreshing, while the banana pudding lends the velvety goodness to make this a deliciously, wonderful dessert experience. In a large bowl, whisk together the sweetened condensed milk and water. Whisk in the pudding mix for 2 minutes. Let stand for 2 minutes or until soft-set. Fold in the whipped topping. Arrange half of the cake in the bottom of a trifle dish (or any large bowl). Evenly sprinkle a layer of blueberries over the cake. 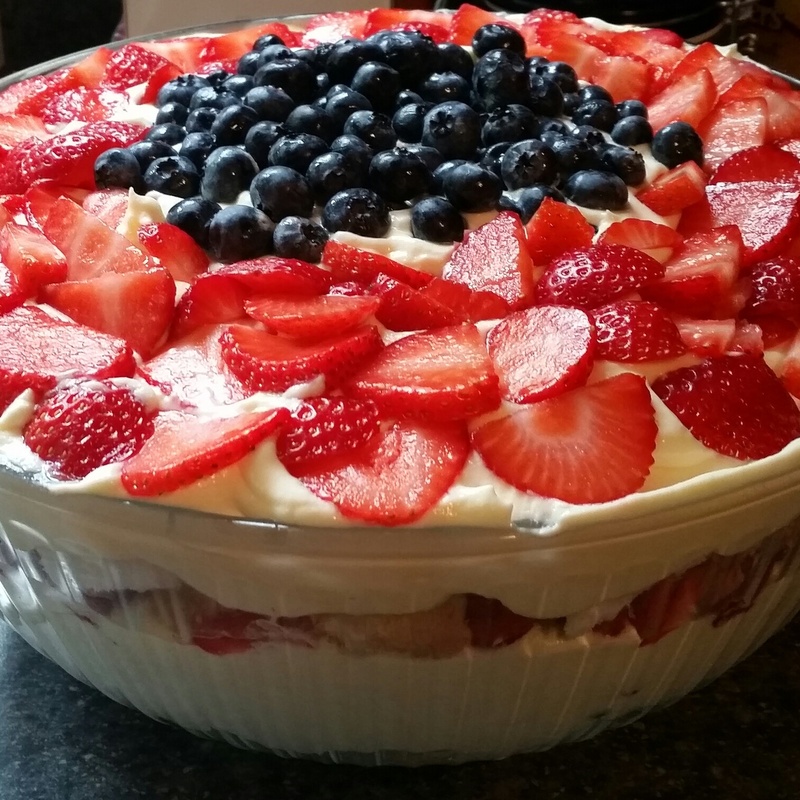 Layer the remaining cake cubes on top of the strawberries, then add more blueberries and then the remaining cream. Finish with the remaining strawberries and blueberries. Arrange in a pattern, as desired. I love soup. I love a soup that is filling. 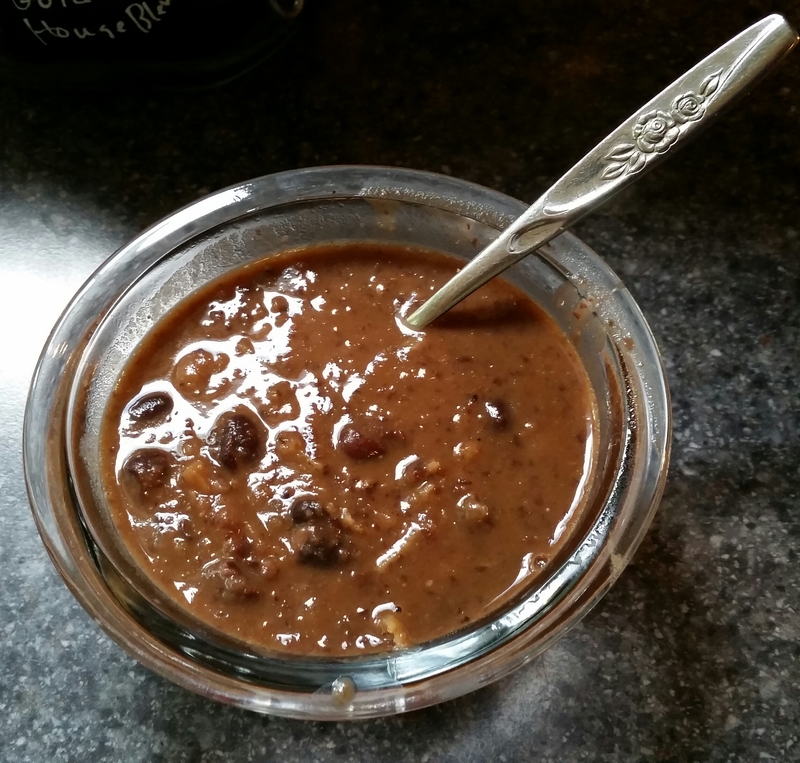 That’s why this black bean soup is so wonderful. And so simple to make. Perfect for the cool Fall weather that is descending upon us, far too quickly. This soup is like a warm sweater on a cold day. Over medium-high heat, saute onion and cumin until translucent, 8 to 10 minutes. In a large pot, bring vegetable broth and black beans to a boil. Lower heat, simmer for 10 minutes. 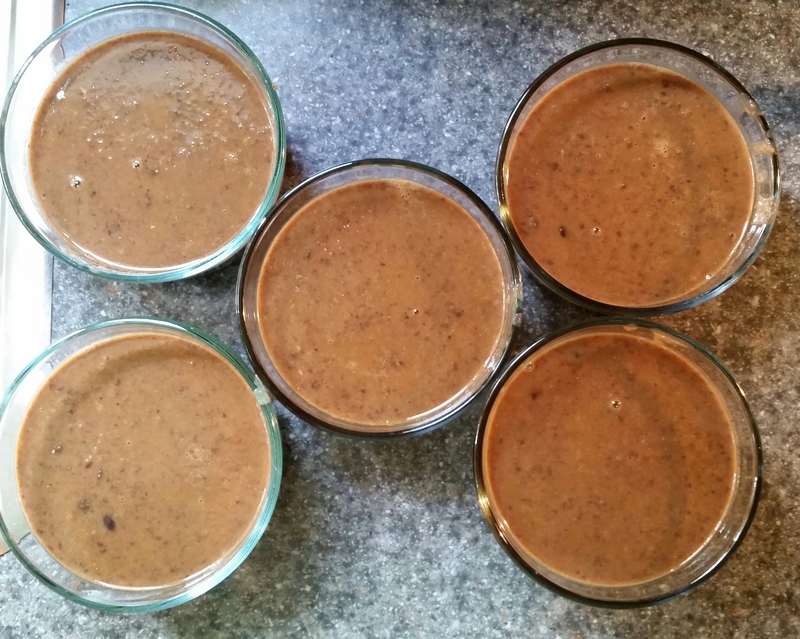 Once beans are finished simmering, carefully ladle half the liquid and half the beans into a blender. Add onions, chipotle peppers and paprika to blender. Pulse until pureed. Add puree back to pot and mix. Season with salt and pepper. Garnish with sliced avocado, Greek yogurt, shredded cheese, etc. Either you love White Castle hamburgers, or you fiercely detest the very smell. And that smell, it permeates everything; the car, your clothes, everything. I am in the camp of destesting them. My husband on the other hand, loves them. So, we meet in the middle on occasion, and I make this White Castle casserole. Of course, it’s not the real thing, but it’s pretty darn good. The hamburger with half the onion soup mix; drain fast and season with salt and pepper to taste. Stir in the remaining soup mix and put meat into a 9 or 10-inch pie plate. Stir in half the cheese, then top with remaining cheese. In a medium bowl, beat eggs, mayonaise, cream, salt, and pepper. And then, or evenly over the meat. Garnish with dill pickle slices and mustard, if desired. Cut Brussels sprouts in half, and cut into shreds. Cook bacon in large skillet over medium heat for 8 to 10 minutes, until crisp; remove bacon, and drain on paper towel. Reserve 3 Tbsp of drippings in skillet. Crumble bacon. Sauté apples, shallots, and garlic in hot bacon grease over medium-high heat for 3 minutes. Stir in vegetable broth and next 3 ingredients, stirring to loosen particles from bottom of skillet. Bring to a boil. Reduce heat and simmer for 5 minutes. 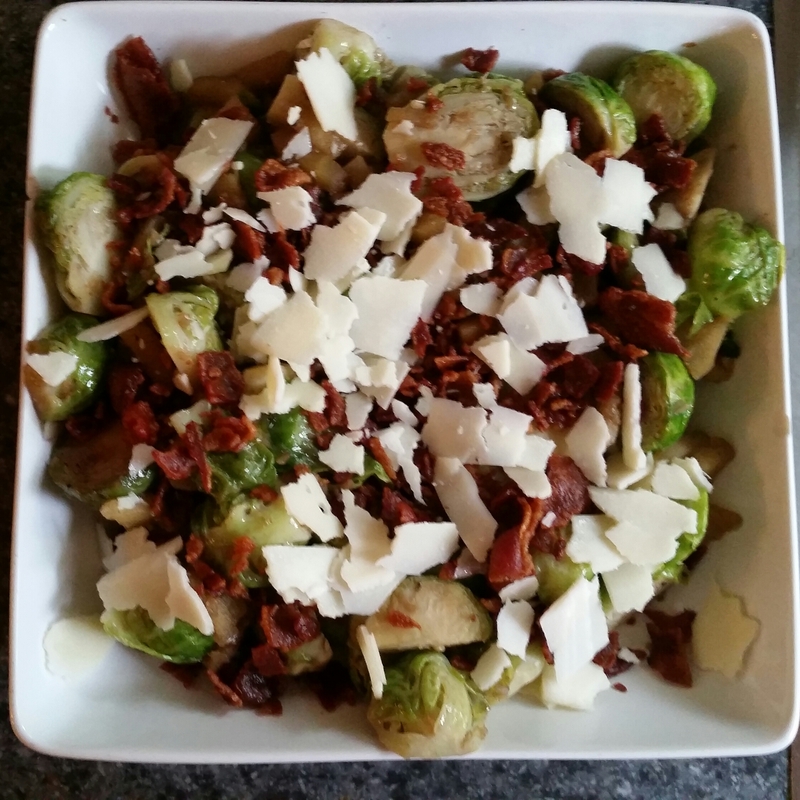 Add Brussels sprouts; saute for 8 to 10 minutes until sprouts are crisp-tender. Top with shaved cheese and crumbled bacon. It’s going to be rather warm this week, a total 180° turn from last week. 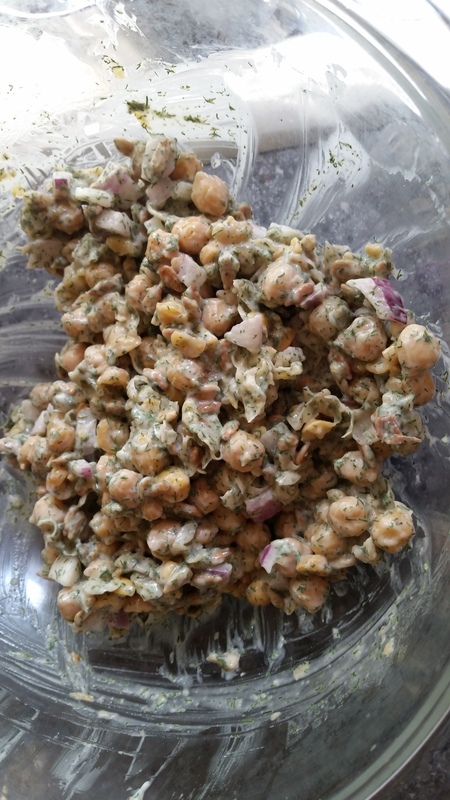 So, I decided to make something a little light and cool – chickpea sunflower seed salad. I have to admit, there is a garlic herb sauce that goes with this salad, but I’ve never made it. Frankly, I just love the salad so much I don’t think there is anything that could make it any better. 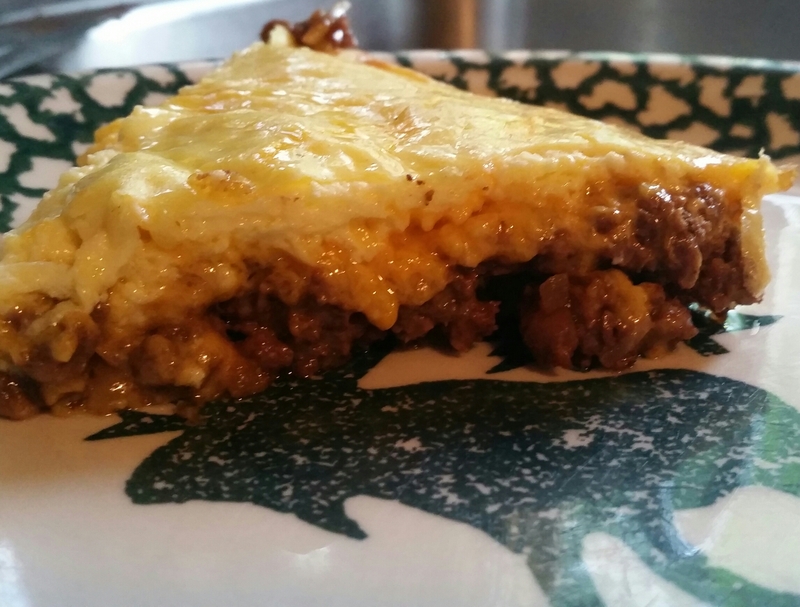 But if you want to try it, hop on over to The Minimalist Baker for the full recipe. I’m planning on making a sandwich on sweet Multigrain bread, topped with a tomato and zesty alfafa sprouts one day this week. Then take crackers one day, and use it as a dip. But, more than likely I’ll just eat it plain, with a fork. Nummy, yummy! Put chickpeas in a mixing bowl and lightly mash with a fork. Add sunflower seeds, mayo, mustard, agave, red onion, and dill. Thoroughly mix with a spoon. So, this coming week is going to start feeling like fall. I know, I know, it’s only the beginning of August, but the highs are going to be in the 70s and the lows at night are going to be in the 50’s! 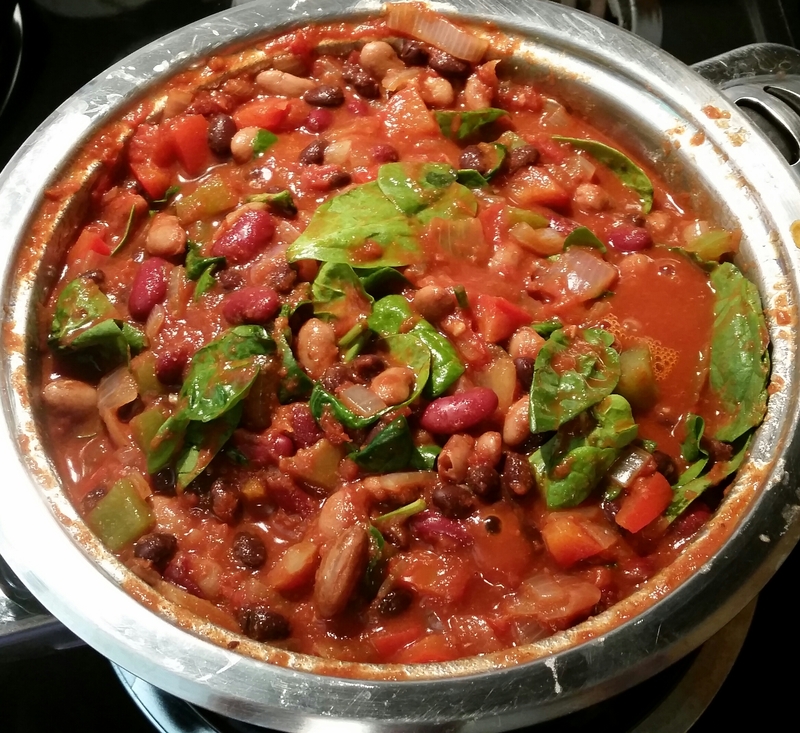 With that being said, I’m sharing my very favorite vegetarin chili recipe. Have a great week! Over medium-high heat, lightly saute peppers, onion, and garlic. Once the veggies are soft and fragrant, add all the other ingredients. Bring to a boil. Reduce heat and let simmer for 30 minutes or longer, as needed.